Notes on culture, technology, and the occasional personal item. Ok, I have now mastered just enough knowledge of the WP templates to be disatisfied with how this blog is working. Sometime very soon I’ll be doing a major redesign, as well as expanding the content, though the latter will probably wait until summer. My other projects have slowed down because funding at my school has really dried up. Now I’m having to back up and redesign several of them, at least for now. The main difference will be focusing more attention on the Bay Area in comparison to NL. I had planned to wait another year or so before getting into this angle, but since travel abroad is tough right now, I’ll focus closer to home. Happily for me I’ve ended up in the last nine months or so meeting a lot of artists, hackers, scholars and others who occupy a similar “space” to those I’ve been working with in the Netherlands. More on all of this soon, but untill the end of term next month, updates will be sporadic. This entry was posted in me, Research and tagged book project, me on 21 April, 2009 by Kim. 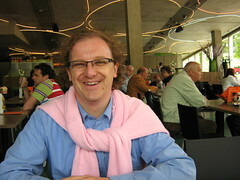 Florian at Ars Electronica 2007. Note, visit Ars Electronica 2007 for more info. about Florian winning the Prix Ars prize for theory. I was still a student in 1995, in Comparative Literature, and there was a conference in Berlin. It wasn’t really a conference so much as a public culture event, and it was called Soft-Moderna –soft modernism and basically it was organized by people from the American Studies program from the John F. Kennedy Institute in Berlin, and it imported the whole Brown University Hyperfiction discourse. So it was about literature and the internet and computing, but heavily based in the whole hypertext-hyperfiction paradigm. And bringing together Robert Coover for example and some German people who were doing early experiments in that field. And you could see the whole helplessness of people there, and they also operated in the new media paradigm so they asked a couple of media journalists and media studies people to be on this panel and discuss this whole thing. And you could see this complete helplessness. And I was just this young student and I just stood up and asked critical questions. I didn’t talk so long, maybe two minutes or so, but I was really critical of what they had said. And then basically the organizer of the conference said well, you seem to know more about that stuff than the people we had on the panel, so do you want to be in the next conference? So that was actually my first public lecture and I was on a panel with Friedrich Kittler (!) and Andy Müller-Maguhn the spokesperson from the chaos computer club. And from there I got writing commissions and I gut sucked into this whole field. This is a short one, but next time I’ll be covering what Florian likes about the field, his concerns about the art being produced, and his own role. I’m interested though to learn how closely connected new media and hyperfiction were early on and how hyperfiction/text was really one of the basic paradigms because today in the US, hyperfiction seems like a narrow genre that a few people are really getting into, like Nick Montfort, but at least on the conference circuit it seems to have lost it’s place as being so basic, being something everyone knew about and discussed. This entry was posted in Friends, Research and tagged book project, Florian Cramer, new media on 21 November, 2008 by Kim. We moved on to discuss “new media” as a discipline and I mentioned how both Sher Doruff and Renee Turner had said one thing that attracted them (among other characteristics) was the lack of constraints on the field, because no body knew what was possible or not, and no one expected or required that any particular methodology be used. I’m afraid I also indulged in a mini-rant about how often I’ve seen presentations that were basically just descriptions of the speakers encounter with some situation involving new media, and just stopped at that–no analysis, no theory, no further data… Ahem. Anyway, Florian (as usual) had a far more thoughtful take on this issue. I go even deeper than that and say that there is a lot in the so-called new media field, especially in the more alternative, or activist, or off-mainstream field, a kind of naive continuity of cybernetics. What do I mean by that? Well cybernetics in the 1950s and the 1960s was basically the idea that we operate with a notion of system-feedback-control and that these are descriptors that we could commonly apply to both artificial and natural systems. So that means we can analyze a society in terms of feedback, control or whatever. We can describe human organisms, we can describe politics, but we can also describe a machine. And here I noted we had arrived right at Katherine Hayles! Florian agreed and continued. Then what I see in the so-called new media field is that it was from the same paradigm except that it doesn’t work with this classical behaviorist model which is really about almost totalitarian control fantasies, but their model is something like the rhizome. But the rhizome is just another cybernetic model and it is based on the same idea of using that structure in order to compare the internet to human society, etc etc etc. And that is something I find very questionable and I also want to do more critical writing on. And I think there is little reflection and little awareness of the continuity of these cybernetic paradigms. And nobody questions for example the notion of “system.” System is a highly speculative construct. I mean you say we are systems, society is a system, the human body is a system, and a computer is a system. But I think this kind of rhetoric obscures and clouds more than it actually helps to analyze things and I think we have to go beyond that. For me, really critical media studies would be to question both notions. But I see when I say this that I’m really making myself enemies. And even with people with whom I wouldn’t have thought it. Well I thought they also come from a really critical camp. But it’s really astonishing to see how deeply these paradigms are really embedded into the whole field. So now, after these two entries, we are about 17 minutes into the interview, and I already feel like I’ve swallowed a rich media text! In the next entry we finally get to the actually reasons Florian got into this work. This entry was posted in Friends, Research and tagged book project, Florian Cramer, new media on 15 November, 2008 by Kim. Ok, there aren’t really any secrets but I haven’t seen any really biographical interviews with Florian anywhere else, so maybe it will be some kind of revelation. 🙂 I’ve known Florian for a long time now, about 15 years, but when working on my projects in the Netherlands, I realized we had never talked very explicitly about his own history with technology, art, culture, etc. –For reasons that will become clear, I am not using the term New Media. First, new media means something totally different in the US than in Europe. Here it means digital or computer media, ala Lev Manovich, but in Europe TV and radio are often included in that, in fact, from a historical perspective, all media is new at some point. Second, the terms medium and media are being used incorrectly throughout the field. For example, if we speak of radio, one of the earliest technologies to be discussed as a medium, then technically the medium, the carrier of radio waves, is air. This was then extended metonymically to include the waves themselves, then further expanded to include the devices themselves, the senders, and even the receivers (that is the people sending and receiving). So that the term now encompasses so much, it’s not even very useful. I explained that while I agreed with this critique, I’ve been using the term as the most broadly understood as covering the territory I mean to explore, but I am coming to believe that it’s really time to dispense with it altogether. At any rate, I reiterated my question, how did he get started? According to Florian he started by programing his own computers when he was 13, and in fact might be considered to have been doing the same stuff for 25 years: he used computers to generate random poetry which he published in his own punk fanzine. 🙂 The most fascinating thing for him then was the random generator, though of course now that he’s “older and wiser” he knows that the randomness of a computer is not true randomness; it’s “pre-determined chance.” This shaped his interest; the kind of meta reality, textuality, emergence of code, and also the connection to society and all the arts. But back to the timeline; I asked how at this starting point at 13, in 1982 how he even had a computer. Through friends he started using them, especially an older friend who used computers to trigger the light show for his music–all of this was programmed in Basic. They’re not the perfect machines and they’re not the dream machines, and this is what also cripples the whole new media field. Basically there have been all these kinds of utopian expectations. The first machine I had was incredibly primitive; it had 1 kb of memory. But today’s machines cannot really do more. And the structure of programming is not at all different, it’s just more comfortable. The machines have become faster but they haven’t become smarter. And what also surpised me, when I came to the Netherlands, is that even more than in other parts of the world, is the expectation that somehow computers will become smarter or less deterministic. And you can name those expectations with certain names such as artificial intelligence –where computers are not just stupid sytactic machines, but become semantic machines that have a true understanding. Or artificial life; that you have something like emergence , or whatever, out of computers. And the third one I think is new media. The whole idea, especially in the 1990s with the whole virtual reality nonsense, is that somehow through multi-media interfaces, the machine wouldn’t be this whole command-line deterministic thing, but would become more intuitive, less deterministic…. but if you’re a smart computer user you know that a mouse click is the same as typing a command. The logic remains the same. So that is Florian’s take on new media as such, and a tiny bit about how he himself got involved. But in the next part we talked much more about the actual conditions of the field (however one names it) and about his own history, from being a graduate student in comparative literature to his current role as Director of the Media Design MA course at the Piet Zwart Institute. I should also note that Brenno is starting to establish quite a journalistic reputation when it comes to reporting on IT and issues of privacy, freedom on information, and related matters. For example, he has relentlessly pursued the privacy problems with the OV Chipkaart. You can see the most recent article at WebWereld–all in Dutch though. An interesting thing about Brenno’s work is how he manages the rhetorical frame around these issues in order to be more persuasive. Rather than using the usual hacker image and discourse which is scary and paranoid, all about protecting individual’s privacy, instead he talks about protecting data in more business-like terms which are far more appealing to government and business types, but in the end lead to the same desired results. An interesting example of someone co-opting corporate language and discourse in the inverse of the way corporations often try to co-opt user discourse. This entry was posted in book project, Friends and tagged book project, Brenno de Winter, privacy on 11 November, 2008 by Kim. Having got through everything I want to say for now about IR9, I hope to finish with my summer interviews–it’s not too long now until I go back to NL for more interviews, so I have to get these done! So actually one of the earliest interviews I did in the summer was with Brenno de Winter, who I actually first learned of through his podcasts and and website, Laura Speaks Dutch. –That’s a great resource for learning Dutch, by the way. Strangely, he turned out to be the one who had translated the instructions for how to use GPG with Mac mail and when I realized he had done these two totally different but helpful things, emailed to thank him. Once I learned more about his work in IT security and as an IT journalist, I decided to interview him. Also, we’ve gotten to be friends, so it was nice to meet in person finally anyway. Brenno has a fairly classic history with technology, from the gender standpoint. Like many male geeks, he started very young and was coding before age 10. But beyond that, I’d have to say he violates most other stereotypes about male geeks or hackers. He tends to wear preppy clothes, is quite sociable, has a very positive attitude toward people at all skill levels when it comes to technology, as long as they are trying to educate themselves, and he shows no hostility at all toward girl geeks. In fact he’s very supportive. Our conversation was not so focused because his work is really outside the new media stuff I usually look at, but we did have a very interesting discussion of what the atmosphere was like in the open source and hacker communities and how it might have changed over time. He felt that when he first got involved, it was very community-spirited, and even described himself as feeling tearful at some evnts, because he was so moved by how everyone cooperated and how warmly people behaved toward each other. Over time though he feels this has diminished and gave the example of his own efforts to found a house in Amsterdam where hackers could live for free. He met with a group of them and offered to help them find funding, which he thought might be fairly easy. But because the group could not reach any agreement at all about how the whole thing might work, it just collapsed and went nowhere. This really seemed to echo some of how William Uricchio has described his own frustrations in trying to organize new media scholars in the Netherlands for everyones mutual benefit. I wonder if no longer being such small and beleaguered has actually made it harder for people in these groups to unite. This is a fairly common problem when a group that has been outcast starts to gain social currency; since they no longer have to spend all their enrgy and resources to survive, room opens to argue about how to spend the “excess.” Or everyone gains a little power and security, and suddenly they have something to lose, and so they become territorial. I guess no matter how technology changes, in some ways, people never do. Anyway, nowadays Brenno is working on a project called Small Sister that aims to educate people about privacy issues and provide tools with which they can guard their privacy in these frightening days of increasing data-retention. It’s already a cool project just in the way it collects together so much useful info about protecting your privacy, but I’m looking forward to seeing what they cook up themselves. He’ll be speaking at 253C in December, so if you are around Berlin, go see him. This entry was posted in book project, Friends and tagged book project, Brenno de Winter, privacy on 9 November, 2008 by Kim. OK, finally I’m on the last women I spoke with on this last trip, Audrey Samson and Nancy Mauro-Flude. This joint interview was less formal and in depth because we had trouble finding times when they could meet and eventually met altogether for just about and hour. They’ll be among the first with whom I follow up. I originally met Nancy and Audrey last summer when they were graduating from the Piet Zwart Media Design MA program. I had been impressed by both of their projects and was interested over the subsequent year to see that they were both involved with the Genderchangers as well as continuing with their own work. Audrey grew up in Canada and got her pilot’s license before going to school for a BA in Art and Design. She didn’t do too much with computers at first, apart from learning skills that might make her more employable. One of her ongoing concerns is how people communicate and she’s interested now in how different technologies can shape and facilitate that. When I asked about what she had observed or experience around gender, she felt there were definite stereotypes. She felt she had to prove her tech savvy to men sometimes–for someone who can fly a plane, this seems especially tiresome. More than that, when she was learning to code, she felt that the men around her got impatient if she “slowed them down” by needing more or different explanation. Now she is working with the Genderchangers and she has felt that Genderchangers is more comfortable as a place to learn than what she has experienced before. Though Audrey has had less experience and less time to reflect, I was interested to see that again time seems important, or in this case, speed. I’ll be speaking further with Audrey to see how things look to her as she continues teaching. ok, next time I’ll continue with Nancy. This entry was posted in Friends, projects, Research and tagged Audrey Samson, book project, feminism, gender on 6 September, 2008 by Kim. Or discontinuities, or whatever term captures the idea that a field that previously seemed really fluid and border-less no longer is so. Coalescence? Coagulation? Choosing the right metaphor seems much more important these days. I spoke to Sher Doruff a few days ago and really wish I’d by then acquired a recorder–still working on that in fact–because it was a brilliant interview. She has been working on new media for a long time, much longer than most of the others with whom I am speaking. In fact since the mid 70s, before any one was even talking about new media the way we do now, Sher was working with electronic music. She was part of a band in this genre before moving more into computer work and even more experimental audio stuff –we didn’t go too far into this part of her story though. I really started with the points at which she moved into new media, and at which she came to the Netherlands. It seems she feels she started with new media pretty early, as I said, and mainly because of the freedom she believed it would offer both because the technologies were so new, no one had any pre-conceived idea of technical limitations, they just tried anything and everything. Further, in those early days, there were no stereotypes about computers being only for men, or that men were more inclined or more skilled at them–no one really felt very skilled. This was sort of a revelation to me because the other women I’ve spoken with are younger–between 25-45–so they entered the larger story much later. Most of the other women mention the lack of perceived limits when it comes to what the tech can do, or at least the feeling that it offered more freedom to them in some way, but most of them did not have such an experience of thinking they would be able to completely shed gender stereotypes related to careers or activities. –I can see this will be a point I need to look at in all the ineterviews since so many people have mentioned it. Anyway, Sher had a pretty good career developing in New York but then her apartment burnt down and she decided to go to France, ended up doing a residency there, and they went up to Amsterdam where she started doing some stuff for Steim, and just stayed there for awhile. Most recently she was at De Waag, where I spoke to her last year, but now she is teaching at the Theater School (part of the Hogeschool in Amsterdam). She has had other more immediate reasons for leaving one path for another whenever she made a change, but she also seems to reach a point in any medium where she feels she has figured out what she wanted to know and then turns to something else. Sometimes she later goes back, and of course, she doesn’t abandon any of them really, but rather shifts the focus of her inquiry (from what I can tell). Sher had a mixed view of the New Media scene in general. On the one hand, she feels that new media artists, especially people working online, are paralyzed precisely because the tools are now so easy to use. I know what she means; it’s similar to what happens with course management systems at the university. Those CMSs make it pretty easy to put stuff online for a class, but maybe not in exactly in the way you want to try. But it’s so much easier than doing it all from scratch, and seeing how it works in the CMS can make thinking of alternatives even harder. But my own experience has been that while the majority of people don’t go beyond the limits built into most plug ‘n play type software, usually there are some number who hit the limits, get frustrated, and switch to learning how to really do it themselves. Maybe artists who can do that ought to rethink their whole practice (or even career choice) anyway. So that’s one of the more negative things she said. But she thinks there will eventually be a crisis, and then a renewal, or a new approach. On the other hand, she was not so worried about the coagulation of the new media field. She feels that the separation into different subfields will create difference, which she generally regards as a good thing, and that these different groups will come up with different ideas, questions, and answers, and different ways of thinking about the shared ideas, questions, and answers. –And so these groups when they do interact, would have much more fruitful exchanges. I asked Sher if she thought the groups actually would interact and share, because so far I find that they don’t seem to communicate so much lately, and William felt this as well. But Sher thinks that they still cooperate far more than most other disciplines. I wonder though if it’s really that the new media organizations Sher works with are cooperative, but that other types, like universities, are not so much. I mean, maybe it’s over-generalized. Another point to compare across interviews. We also talked about the creative industries, some of the specific Dutch institutions, and her current work with Brian Massumi, but I’ll put that in the next post. 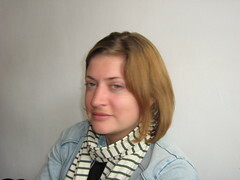 This entry was posted in new media, Research and tagged book project, feminism, gender, Netherlands, Sher Doruff on 8 July, 2008 by Kim. Even though I’m not teaching as much this term, I am just buried in work. I’m co-chair a conference that takes place in two weeks and will so glad when it’s over. What a headache. Plus I am trying to work on some grant proposals, sent in the two IR 9.0 proposals, and just sent off a chapter proposal. Whew. On the up side, if the conference and chapter proposals are accepted, I will have a lull on those fronts until summer at least. Speaking of summer, I will be headed to the Netherlands again for more interviews. I’ve been doing some via email, but I also need to go on site to visit some of the new media programs/centers. I may also give some talks, but that’s up in the air right now. Whatever else happens, I will see all my Rotterdam friends again, and finally (I hope) meet Brenno de Winter in person, plus a new acquaintance, Elfi Ettinger. Elfi is on one of the panels I put together and teaches at the University of Twente. In spite of being so busy, I spent most of the day in a workshop about writing successful grants, except for the last two hours in which I heard Clark Buckner speak about “Autonomy, Plurality, and Play in Contemporary Art.” It was a good talk, and the workshop was informative, but I’m just exhausted now. More later. This entry was posted in book project and tagged book project, Brenno de Winter, Netherlands, privacy on 29 February, 2008 by Kim. Earlier this month I posted a proposal which did not get accepted for further submission and evaluation. I have to really thank Florian for being quite forthright about completely incoherent the first version was, and asking pointed questions that allowed me to see what needed to be straightened out. So I revised and revised and revised, which isn’t always my favorite thing… But this was fun. With the introduction of the Internet and WWW in the 1990s, scholars, artists and activists began a critical engagement with technology. These early adopters were a loose collection of individuals that came out of many fields, including philosophy, literature, film studies, sociology, computer science, and also from outside of the academy; journalists, politicians, artists, activists and business people have participated in this discourse community as well. This diverse group was united by their shared observation of and concern with the effects technology was having on their respective fields. There were few possibilities then to reflect on new media from a scholarly perspective; instead the issues were debated in popular discourse, in the networks of the early adopters’ various fields, and were explored in conferences and festivals. For example, in 1988 Ars Electronica featured contributions from Kittler, Baudrillard, Flusser, and Weibel, each of whom was trying to elucidate what we now commonly describe as new media. But while early scholarship on new media came from traditional fields such as literature, sociology, art and art history, film and media studies (Hayles, Kittler, Castells, Uricchio, Manovich); recently institutionalization has been driven by former members of the early adopter networks entering academia (Fuller, Lovink, Cramer, Juul, Montfort, Rieder, Schaefer, van den Boomen, Terranova). As this field and its knowledge are crystallizing, the process raises immediate questions: what is the relation between institutionalization and the people, physical things, and symbols in the networks that gave rise to new media? How are institutions constructed that critically reflect on emerging technologies? How is the fluid knowledge shared between participants becoming crystallized, being canonized, such that some groups are included or excluded? And finally, what do we gain and lose in knowledge production through this process? Because European countries hosted the first networks and festivals devoted to a critical engagement with new media; has invested far more public funding into cultural and academic programs around it; Europe now has far larger, more varied, and more mature institutions producing, studying, and teaching about new media. This diversity makes it fruitful ground for study, but while some cities, projects, people, or organizations have been studied in isolation by pioneers such as Manuel Castells (The Internet Galaxy), Geert Lovink (Dark Fiber) and provide preliminary insight into the institutionalization of new media, no comprehensive studies have yet appeared. I intend a rhetorical analysis of the scholarly discourse on new media in Europe which I will approach as a dispositif. While Foucault applied this concept to historical archives, I propose exploring the human archive embodied in the actor-network of individuals and groups currently working on new media, beginning in the Netherlands. The Netherlands is the best starting point because some of the first university programs in new media began there, and thanks to early and extensive government funding, a wide array of other cultural institutions have developed simultaneously. The Dutch context was originally characterized by heterogenous networks of people, things and symbols that were ad hoc and informal, but now all of these disparate elements contribute to the establishment of formal knowledge, specialization, and the construction of a canon. These activities are a clear sign of institutionalization, which also inevitably involves the development of gate-keeping processes. However, while institutionalization is taking place, the cooperative polder model still shapes socio-economic relations and allows for the continued emergence of new voices and new groups. Thus the whole spectrum of development is available for study. In addition, the development of new media in the Netherlands allows study of other important questions: how are a loose group of people, the early adopters, who were not at first members of the academy, contributing to the creation of a field, a discourse, and knowledge by running events, funding grants and supporting themselves in the process, and how are they molding what started almost as folk practice into official knowledge, bringing not only their experiences, but their networks into the establishment? New media institutions are developing rapidly and successfully in the Netherlands; which conditions are necessary for fostering and speeding this process as it has happened there? For this study I have begun visiting and observing a variety of groups, including De Waag Society for Old and New Media, V2_Institute, Worm Rotterdam, and De Geuzen artist collective. Further visits to these institutions have been arranged for the award period, along with observations at the University of Utrecht Department for Media and Culture Studies, the Piet Zwart Institute Media Design program, among other academic institutions. Observing this network over time will allow a comprehensive rhetorical analysis, using Burke’s pentad to better understand the functioning of actors within these networks, and will yield a better understanding of how knowledge in an emerging field is institutionalized. 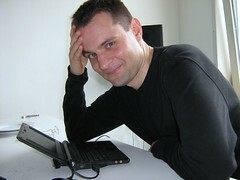 This entry was posted in book project, Friends and tagged book project, Florian Cramer, grants, Mirko Tobias Schäfer on 1 October, 2007 by Kim.